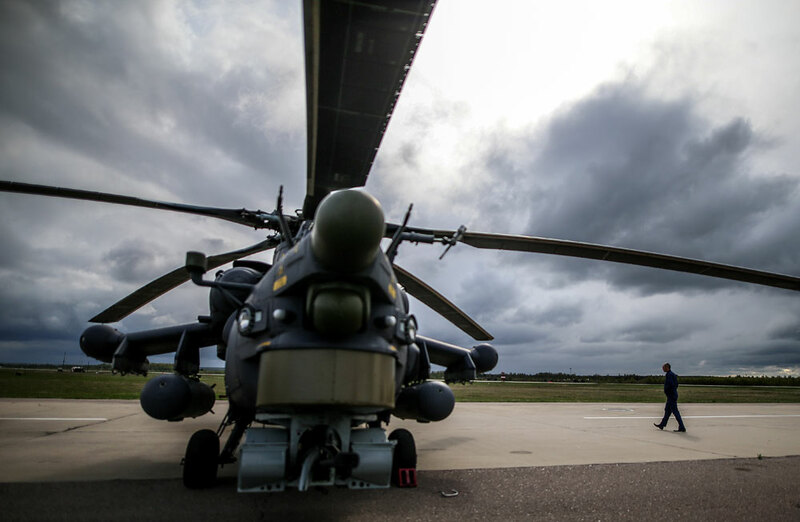 The Russian Defense Ministry has denied allegations that several military helicopters had been destroyed at a Russian airbase in Syria. "All Russian military helicopters stationed in the Syrian Arab Republic are performing their planned duties on eliminating terrorists. There have been no losses among the Russian airbase personnel," Russian Defense Ministry spokesman Maj. Gen. Igor Konashenkov told Interfax on May 24. "The authorship of the rumors on the destruction of a unit of Russian military helicopters and about twenty trucks belongs to ISIS [a terrorist organization banned in Russia] propagandists, who unsuccessfully tried to sell this pseudo-news about ten days ago," Konashenkov said. The BBC had reported earlier with reference to experts from the U.S. geopolitical intelligence company Stratfor that a Syrian airbase near the community of Tiyas, used by the Russian Aerospace Forces, had been badly damaged by ISIS strikes. The BBC said that, comparing the imagery possessed by Stratfor with the Tiyas facility's earlier pictures, its experts concluded that the wreckage of Mil Mi-24 helicopters was seen on the runway. "As for the Syrian airbase's pictures, the burned-up aircraft and automobiles, as well as numerous rocket craters, have been present there for months. This is a result of fierce fighting for this airfield between Syrian government forces and militants from terrorist units," Konashenkov said. "And, if you throw away all lyricism and speak bluntly, it looks like the circulation of such information is all of the so-called contribution that our partners can make to the fight against international terrorism," he said.